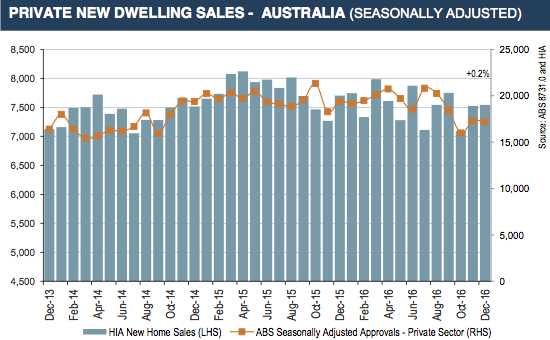 New home sales rose 6.1% in November 2016, but recorded a decline of 0.7% for the quarter, according to HIA's New Home Survey. Further interest rate rises for property loans could exacerbate an economic slowdown. The Housing Industry Association's Stamp Duty Watch reveals current rates of stamp duty mean the typical Australian family is paying more than $100 in additional mortgage repayments each month. The government’s legislation to reinstate the ABCC and bring back industry specific penalties and sanctions will return the rule of law to the construction industry, says the Housing Industry Association. New home sales dropped to a two-year low in October, according to the latest Housing Industry Association data. Residential construction will slow over the next two years, but will bottom out at historically healthy levels, says the Housing Industry Association.